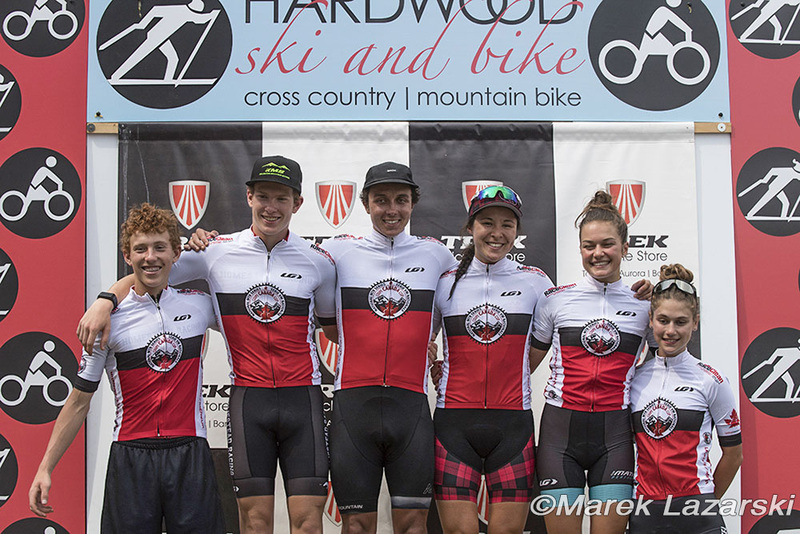 The Canada Cup national cross-country series returned to Hardwood Ski & Bike, Ontario, on June 17th for Round 5 of the 2018 series. All but one of the current Series leaders held onto their jerseys after Hardwood, although the standings are getting tighter as new winners emerge at each round. 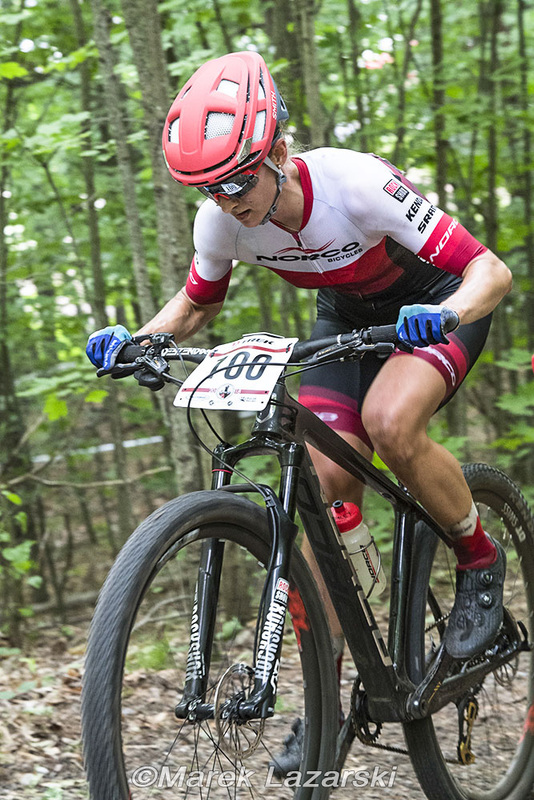 In the Elite categories, Haley Smith (Norco Factory) took her second straight victory in the women's race, finishing a slim 10 seconds ahead of Cindy Montambault (Trek GPL : Équipe du Québec), with American rider Ellen Noble (Trek Factory) in third. Series leader Jenn Jackson (AWI Racing p/b The Crank and Sprocket) finished fifth and remains in the lead with 770 points. Smith, who missed two rounds while competing in Europe at the World Cup, moves up to second from sixth with 575 points, with former number two Maghalie Rochette (Clif Pro) dropping to third with 530 points after missing Hardwood. In the Elite men's Series, a pair of Under-23 riders dominated the race, with Quinton Disera (Norco Factory) beating Sean Fincham (Forward Racing-Norco) and Elite rider Andrew L'Esperance (Forward Racing-Norco). Felix Burke (Équipe du Québec : Rocky Mountain) finished 11th but remains in the overall lead with 710 points, followed by L'Esperance at 530 (moving up from fourth) and Alexandre Vialle (Equipe du Quebec/Toyota St-Eustache), also with 530 points. The only Series lead change of the day was in Junior men, with former leader Holden Jones (Pendrel Racing) - winner of Rounds 1 and 3 - dropping to third overall after missing the last two rounds. Charles-Antoine St-Onge (Équipe du Québec : Dalbix Siboire) took his second straight win, followed by William Côté (Équipe du Québec) and Tyler Clark (Homestead Racing). Clark moves into the leader's jersey with 295 points, with St Onge only six points back and Jones a further four points in arrears. Canadian Junior Expert women's champion Roxane Vermette (CC Mont Sainte-Anne) took her second consecutive win ahead of Marianne Théberge (Équipe du Québec : Mathieu Performance), with Mexico's Fatima Anahi Hijar Marin (Inspira Castel Cemix Cycling Team) finishing third. Theberge continues to lead the standings with 355 points, followed by Mireille Larose-Gingras (Equipe du Quebec/Sigma) at 290 and Vermette moves up to third from fourth with 285 points. Juliette Larose-Gingras (Velo Cartel X BL Coaching) remains in the overall lead of the Under-17 women, despite finishing third, with 355 points. Nicole Bradbury (NCCH p/b Franklin Templeton), fourth in Hardwood, remains second overall with 325 points. Julianne Sarrazin (Velo Pays-D'En-Haut/PG) took her first of the Series and moved up to third overall. The men's Series saw Jeremie La Grenade (Skinouk-VDM) take his third win, with Owen Clark (Homestead Racing) finishing second to hold onto the leader's jersey. Clark has 355 points, followed by La Grenade at 327. 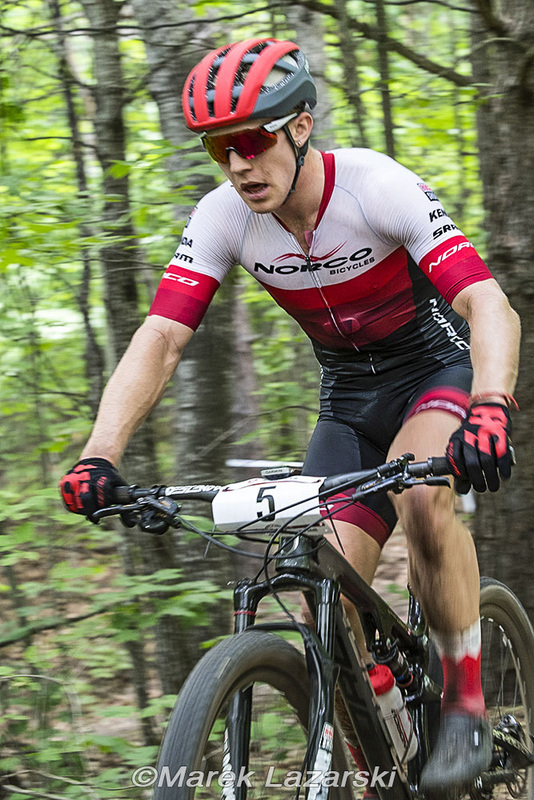 The Canada Cup XCO Series now moves to Whistler, BC, for Round 6 on June 23rd.